Now that we covered the basic staff that you need to know in order to build your App it is time to enhance its appearance and its functionality. The interface is very important fot the user as it must not only be friendly but also easy to use. At this part we will transform your Shiny App into a beautiful Shiny Dashboard. Firstly we will create the interface and then step by step we will “move” the App you built in the previous parts into this. In part 8 we will move the app step by step into your dashboard and in the last two parts we will enhance its appearance even more and of course deploy it. Install the package shinydashboard and the package shiny in your working directory. A dashboard has three parts: a header, a sidebar, and a body. Here’s the most minimal possible UI for a dashboard page. Add a dashboardPage and then Header, Sidebar and Body into your UI. HINT: Use dashboardPage, dashboardHeader, dashboardSidebar, dashboardBody. Name your dashboard “Shiny App”. HINT: Use title. Next, we can add content to the sidebar. For this example we’ll add menu items that behave like tabs. These function similarly to Shiny’s tabPanels: when you click on one menu item, it shows a different set of content in the main body. There are two parts that need to be done. First, you need to add menuItems to the sidebar, with appropriate tabNames. Create three menuItem, name them “DATA TABLE”, “SUMMARY” and “K-MEANS” respectively. Make sure to use distict tabName for each one of them. The icon is of your choise. HINT: Use menuItem, tabName and icon. Add tabItems in dashboardBody. Be sure to give the same tabName to each one to get them linked with your menuItem. HINT: Use tabItems, tabItem, h2. Obviously, this dashboard isn’t very useful. We’ll need to add components that actually do something. In the body we can add boxes that have content. Firstly let’s create a box for our dataTable in the tabItem with tabName “dt”. Specify the fluidrow and create a box inside the “DATA TABLE” tabItem. HINT: Use fluidrow and box. Do the same for the other two tabItem. Create one fluidrow and one box in the “SUMMARY” and another fluidrow with four boxin the “K-MEANS”. Now just copy and paste the code below, which you used in part 7 to move your dataTable inside the “DATA TABLE” tabItem. Place the sample code above in the right place in order to add the dataTable “Table” inside the “DATA TABLE” tabItem. Now just copy and paste the code below, which you used in part 7 to move the dataTable “Table2” inside the “SUMMARY” tabItem. Place the sample code above in the right place in order to add the dataTable “Table2” inside the “SUMMARY” tabItem. Do the same for the last exercise as you just have to put the code from part 7 inside the “K-MEANS” tabItem. 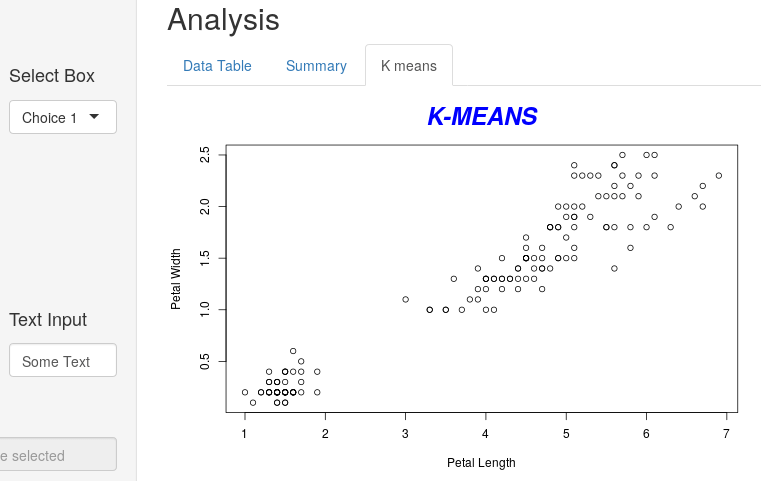 Place the K-Means plot and the three widgets from part 7 inside the four box you created before.